It was in walking distance from the train station. At first moment it seemed the hotel has an stylish atmosphere. During check-in was staff polite and nice to me. The room and bathroom were clean. 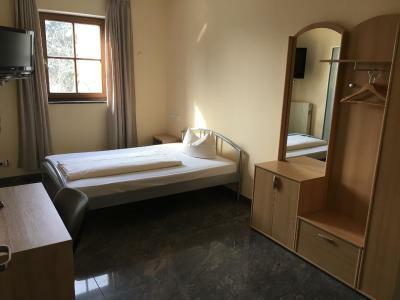 Close to the station and to city centre, friendly staff, good coffee and a clean, tidy room. What i like about this place is that it is really not that far from the train station (I took a taxi in a hurry and the next day walked to the station), is in a very quiet location but only a few minutes walk from the centre with all its restaurants. Lovely and cool on the inside, staff are lovely here, shower and bathroom worked excellently - even the toilet which was in the middle of being repaired but worked perfectly anyway. Nice breakfast at excellent value. Location is great. 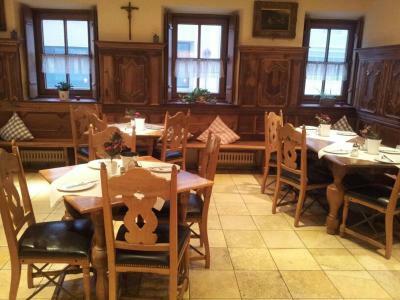 The mood of the dining room is genuine bavarian. There is towel and soap in the room. Friendly staff. The room was clean. 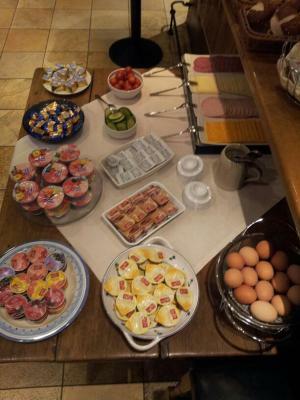 Nice breakfast. Close walking distance to town center. Beautiful granite floors, including on the circular staircase, and lovely glass door to bathroom. Good value for your money. Would stay there again. Perfect to stay over, it was only a fee hours that we've where in the hotel, centrum was nearby. 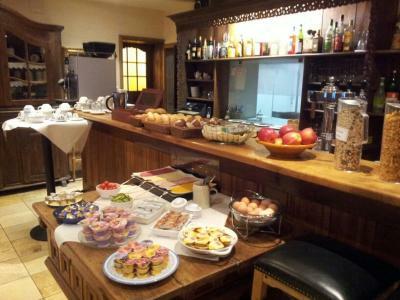 Breakfast was fine, in a lovely rustic room. Rooms and bathrooms were clean, but love seat and chair in my room were a bit stained; they need to be cleaned or covered. Also, there was no lift, and because I have one bad knee, I would have appreciated knowing this beforehand. Beautiful granite floors, including on the circular staircase, and lovely glass door to bathroom. Bathroom window should have a window covering. This was easy for me to do with a long scarf that I had, but they should think about this. 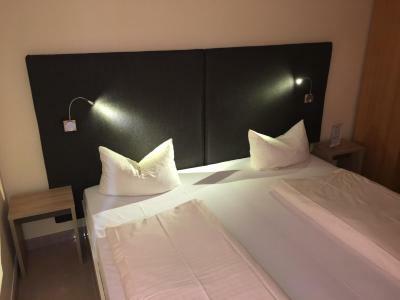 I would stay here again, because the staff were friendly and I was comfortable. 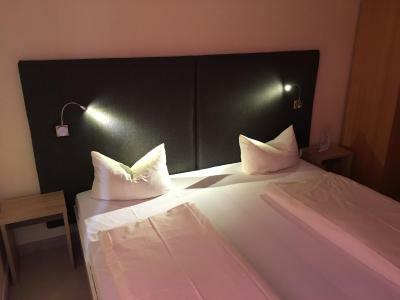 This hotel lies close to the center of Rosenheim, just a 5-minute walk from the pedestrian passage with its numerous shops. 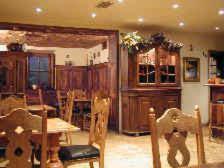 Hotel Hammerwirt offers cheerful, functionally furnished guest rooms with satellite TV and breakfast. The unique mountain scenery of the Upper Bavarian Alps lies right outside our front door, and is waiting to be explored. 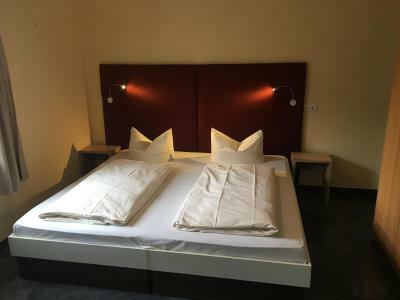 When would you like to stay at Hotel Hammerwirt? 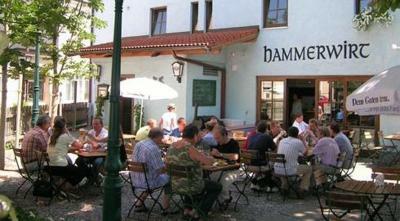 House Rules Hotel Hammerwirt takes special requests – add in the next step! Hotel Hammerwirt accepts these cards and reserves the right to temporarily hold an amount prior to arrival. 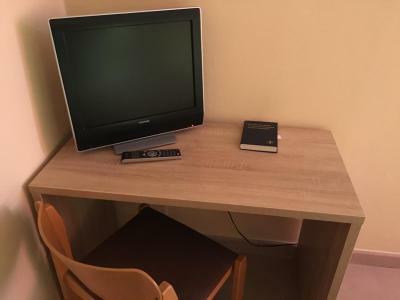 Please note that the cable needed for internet connection must be requested at the reception. For late arrival, guests can retrieve the room keys from the key box. Please contact the hotel in advance for further information. Please inform Hotel Hammerwirt of your expected arrival time in advance. You can use the Special Requests box when booking, or contact the property directly using the contact details in your confirmation. Lights in the room were broken and electricity looked out of them. Room was clean and breakfast was good. When we came (at about 13 o´clock) we could not find a reception. All front doors were closed. Than a man (probably owner) opened seeing me and prepare a check-in. He was polite and nice to me. If the hotel costed 60 - 70 EUR my evaluation would be - it is OK. 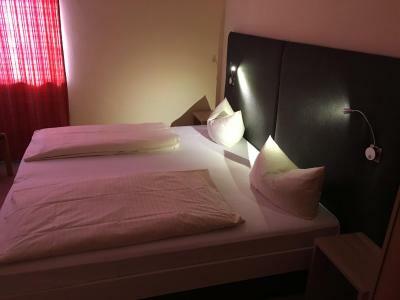 But for the price 120 EUR I expected much higher standard, The bed was not very comfortable, TV very small, the door in the WC and bathroom was not possible shut. The furniture is oldish. The toilet is 30 cm from the door on the right than wash-basin on the left and than shower in front of you (on 1m2). No space between these three units. I hoped that my impression will be improved by breakfast. Unfortunately it was lower standard. No fresh vegetables, below average coffee. 3rd floor and no lift. Too expensive, the toilet had not been cleaned, the flush was leaking and made an annoying sound during the night. There was a random toilet brush in the hall. Room was small and the bathroom was very small. Bed Bugs - This Location should be closed due to Hygiene reasons. Rentokil needs to visit every room. The wifi didn’t work that well, but otherwise everything was fine. Very very small bathroom. No WiFi signal in our room. Not a big point but there is no lift so can be a struggle with baggage. Sink is integrated in the bedroom. We reserved for 4 persons but beds were ready only for 3, and in hotel there was no extra pillow????? Bathroom is too too smallllll. Wi-Fi wasn't working. Otherwise, it was very clean.